This will be Roger’s second solo art exhibition, following the runaway success of his debut show earlier this year. The majority of this new work has been completed over the last few months, much of which tells stories about his experiences as a musician and now, also a visual artist. 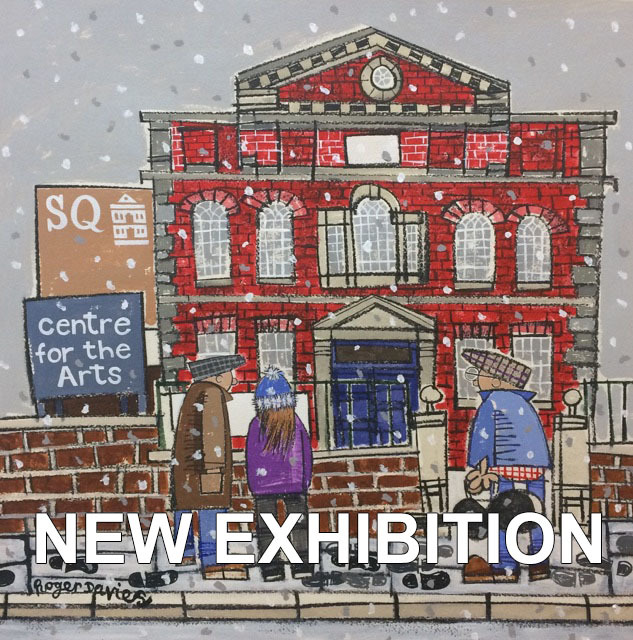 40 new original paintings which celebrate aspects of Roger’s hometown (Brighouse) and the surrounding area will be included in this special exhibition. Local street scenes, music venues, pubs, cafes and shop fronts are portrayed in a style intended to amuse, endear, inform and entertain. Selections of the pictures are presented as a tribute to Roger’s old friend and art hero, the late ‘Pennine Landscape Painter’ Peter Brook. Roger discovered his love of drawing as a pupil at Brighouse High School and subsequently studied at Batley School of Art. He obtained a degree in Fine Art from the Duncan of Jordanstone College of Art & Design in Dundee where he also won a scholarship to spend three months at the Art Institute of Chicago. Over recent years however, Roger has been establishing himself as a musician and is no stranger to local audiences. After five solo albums and live performances around the UK, Roger recently assembled his own full band which released their debut album last March. The show continues throughout October and is included in the 2018 Brighouse Arts Festival programme of events.